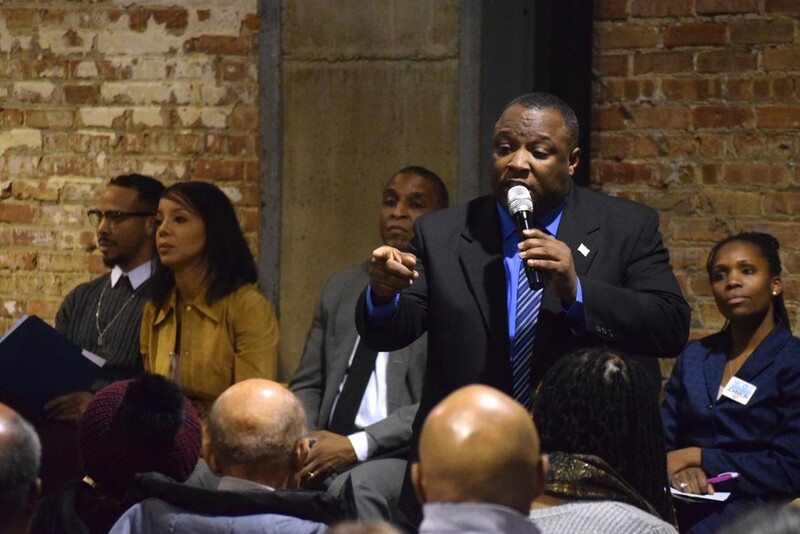 Nine of the 15 candidates running for 20th Ward alderman gathered Wednesday night at the Experimental Station on 61st Street and South Blackstone Avenue, to debate economic development, demographic change, and term limits. The forum was moderated by Sandra Bivens, a director of the Woodlawn Chamber of Commerce, and Cliff Kelley, a radio talk show host and former city council member. Anthony Driver, a former employee at the Chicago Mayor’s Office of Public Engagement, said that he would start a federal credit union for the 20th Ward. While a South Side Community Federal Credit Union has existed since 2003, Driver said that he would also like to open one specific to the ward. “I’ll be looking for private partners, and get the community to invest in it, so they’re all part owners. It’s a way to reinvest in the community and keep our dollars circulating within the community instead of going to outside industries,” Driver said. Maya Hodari, director of development at the Chicago Housing Authority, suggested taking advantage of “key nodes,” or vacant properties at opportune locations, throughout the ward. In particular, Hodari talked about gathering input from residents on potential uses for an abandoned commercial center at 47th Street and Halsted Street in order to spearhead further development in New City. Later, candidates were asked about potential safeguards that they would use against gentrification and the potential displacement of residents that could result. Kametha Hill, a former journalist and member of the United African Organization, said that the ward needs to do a better job of promoting Black-owned businesses and contractors. “Priority needs to be given to Black contractors. We need to have people coming into our neighborhoods who identify with our needs,” Hill said. Driver discussed closing a loophole in the Affordable Requirements Ordinance, which requires that residential projects that use city land must allocate 10 percent of units to low- or middle-income housing. However, developers are also able to pay a “fee-in-lieu” of $100,000 per required unit in order to circumvent this requirement. He advocated closing this loophole to increase low-cost housing citywide. Driver also said that he would appoint a “housing advocate” for the community as part of his aldermanic office, in order to provide the ward with information and assistance regarding housing-related issues. “Eviction is rampant, so we will provide legal resources for you,” Driver said. Democratic committeeman and civil engineer Kevin Bailey called for rent control and a required “liveable wage” for minimum-wage employees. All nine candidates said that they support term limits for local government. “We shouldn’t have career politicians. This process should be for people who want to groom and get young people involved in politics,” said attorney and NAACP member Quandra Speights. Andre Smith, the CEO of Chicago Against Violence who advocated for the opening of the trauma center at UChicago Medicine, said that term limits “[cut] down some of the corruption” in government. Former Chicago Public Schools teacher Nicole Johnson supported three-term limits so that aldermen have the time to fulfill promises to their constituents. “It takes most economic development projects at least 10 years to get started and to manifest the results,” she said. Bailey was undecided when it came to term limits above the county level. “When it comes to the state and federal [level], I think we need to take a look and see what the impact analysis would be to have term limits in these seats,” he said. Another audience member asked the candidates how they would rein in the rising gap between pension benefits owed to employees and state funds allocated to making these payments, without increasing taxes. Johnson said that she would advocate heavily for the development of the South Suburban Airport, a proposed airport that could be built on state-owned land near Peotone, IL, projecting that it would bring in $157 million in state tax revenue. Mayor Rahm Emanuel advocated for a similar plan in December 2018, and Governor-elect J.B. Pritzker called for legalization as a vehicle to generate revenue throughout his gubernatorial campaign. Kevin Bailey, the Democratic Committeeman recently accused by another candidates for fraud in challenging other candidates' petitions, was not present at the forum.